The dusk of the incandescent bulbs gives way to the usage of CFLs. The CFLs have many advantages over the incandescent bulbs. The main reason being higher energy efficiency. Some of the key drivers responsible for a steady growth in the consumer base of CFLs are government initiatives and programs generating greater awareness, rising household demand, huge energy-saving potential, better luminescence, longer life-span, lower cost over the life time as compared to incandescent lamps and reduction in carbon footprint. Compared to general-service incandescent lamps giving the same amount of light, CFLs use one-fifth to one-third the electric power, and last eight to fifteen times longer. A CFL has a higher purchase price than an incandescent lamp, but can save over five times its purchase price in electricity costs over the lamp’s lifetime. Owing to their advantages over incandescent lamps, CFLs are used in abundance; however, they have a short life span of 6000 hours. Therefore disposal rate of fluorescent lamps is high. The major components of CFL are mercury, glass, phosphor powder and metal caps. CFLs rely on mercury as a source of ultraviolet radiation for the production of visible light. However, mercury is a toxic metal and its release into the environment can pose serious threats. Mercury is a persistent bio-accumulative neurotoxin. Chronic exposure to mercury may result in permanent damage to the central nervous system and kidneys. Mercury can also cross the placenta from the mother’s body to the foetus (levels in the foetus are often double those in the mother) and accumulate, resulting in mental retardation, brain damage, cerebral palsy, blindness, seizures, and inability to speak. The mercury from FLs on their breakage is release in the form of Inorganic Mercury Vapour. Most of the mercury vapour in the atmosphere is transported over long distances due to Brownian movement and natural atmospheric turbulence, having transport scales of several hundred to few thousand kilometers. The average residence time of this fraction of mercury in the atmosphere is estimated to be greater than 1 year. Thus, mercury vapour emitted from CFLs has the capacity to cause adverse effects of high intensity over a greater area and for a longer time. 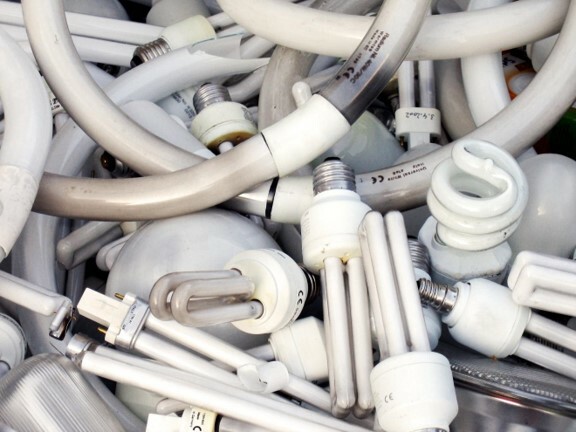 The major challenges related to safe disposal of CFLs are encountered in the quantity of mercury dosing and mercury contaminated waste inﬂux from the informal market – substandard lamps being manufactured and distributed in a growing network and an absence of regulatory framework for safe collection, recycling, and disposal. Each Fluorescent Lamp has an average mercury content of 21.21 mg, which is released into the atmosphere on breakage of the lamp, thus causing mercury pollution. The present practices of disposal of Fluorescent Lamps (FLs) in India are not effective in controlling mercury pollution. 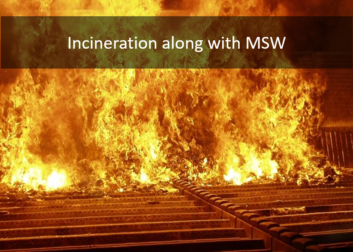 Landfilling or Incineration of fluorescent lamps should never be done as there is high risk of emission of mercury in these cases. 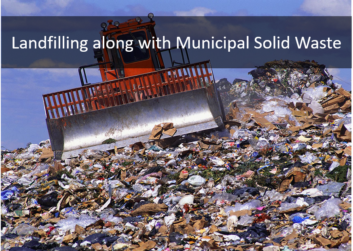 To make sure that spent FLs don’t end up in landfills or municipal incinerators along with MSW, their disposal in trash cans along with general household wastes must be stopped at the individual and community level. For this, awareness must be spread amongst people regarding the harmful effects of improper disposal of spent FLs. The solution to the issue of mercury vapour emission from spent CFLs and Fluorescent Tube Lights (FTLs) lies in the recycling of these lamps and recovery of mercury from them in a manner such that there is no mercury emission from these spent lamps during transit. 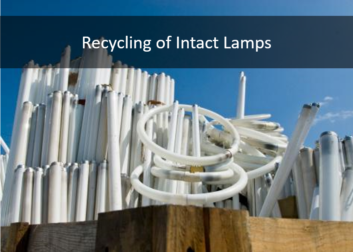 The ongoing process of recycling of mercury containing lamps involves storage and collection of these spent lamps in their intact state and taking it to the recycling centre and then crushing it. This involves the major risk of breakage during storage and transportation, which results in leakage of mercury, leading to its health hazards. Hence, the need for crushing the spent lamps at the point of generation is glorified.